In response, “It is inexcusable that one of our members was the target of this kind of excessive force by the Berkeley Police Department,” Carl Hall, executive officer of the Guild, told Berkeley Mayor Jesse Arreguin and Police Chief Andrew Greenwoodin a letter two days later. Hall requested a meeting to discuss the police department’s refusal to recognize Anderson’s press pass, which was issued by the Guild. The photojournalist was covering the Berkeley City Council special hearing at Longfellow Middle School on the Urban Shield program. Her photos subsequently ran in the San Francisco Chronicle, she said. “We want to talk to them and hear what they have to say about this,” Hall said in an interview. “We would like to see them acknowledge this wasn’t appropriate, and beyond that, we might want to get into more at the procedure or policy level.” The executive officer said he’s currently waiting to hear back from the Berkeley officials. “Context matters,” said city spokesman Matthai Chakko in an email regarding the City Council meeting and its aftermath. “Generally speaking, when police are surrounded by scores of people demanding the removal of a suspect from a police car, and police are asking people to move back, everyone should move back. “As I mentioned earlier, members of the crowd had, according to elected officials, made them feel threatened for making a vote in a public meeting. Unacceptable. In such an environment, it's absolutely relevant for police officers to expect all people to step back, regardless of any credential they may or may not be carrying,” Chakko said. Also, the incident is symptomatic of a broader problem affecting freelancers, Hall said. 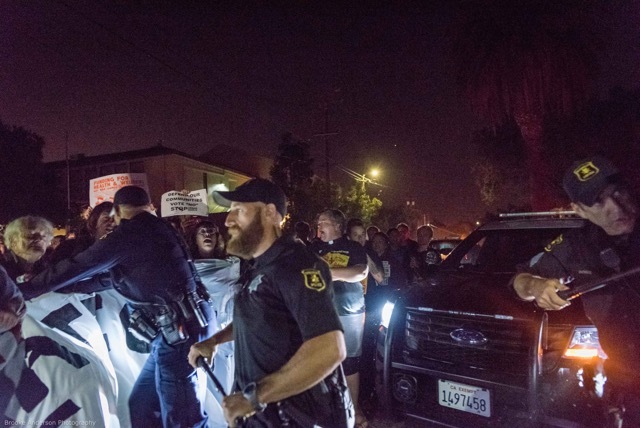 The more than six-hour City Council meeting began Tuesday, June 20 and ended early Wednesday, when protesters rushed the dais as the council voted to continue, at least for one year, police department participation in Urban Shield, according to the East Bay Times. Protesters left the meeting and gathered outside on Derby Street, according to the Times. Photojournalist Anderson, who had photographed events throughout the meeting, followed the group to continue her coverage, she said. “I was trying to get shots” of the action, “but despite repeatedly showing officers my press pass -- I had my press pass on a lanyard around my neck -- and verbally informing them I was a journalist, (police) pushed my camera in my face and struck my camera,” Anderson said. Chakko said, “Threatening elected officials for their votes is a direct threat upon democracy. It is unacceptable. Physically surrounding police cars and demanding the release of suspects – who were arrested for disrupting the democratic process of a public meeting – is also unacceptable. “The actions of those individuals certainly threaten to compromise free speech and democracy – values cherished by the Guild for whom I was once part of the leadership. I know the Guild is also interested in protecting those values, which are critical to a free society,” Chakko said. Guild Freelancers co-chair David Bacon said, “The issue that is being raised in our letter is that there was a Guild-accredited photographer whose images subsequently appeared in the Chronicle. She identified herself to the police as a member of the press and showed her press pass and they shoved her and hit her with a baton. That’s not acceptable behavior toward anybody,” Bacon said. “We have asked for a meeting with the mayor and chief of police to talk about this and if they want to come to a meeting and say that this is acceptable conduct, then let them do so and we will talk it out,” Bacon said, “but I would be very interested to hear why they think this is acceptable behavior for police. I don’t think a reasonable person would agree.